A young woman investigates a shocking island murder that inspired her narcissistic mother’s best seller, which she suspects is more fiction than fact. But what she uncovers are truths too tangled in lies to decipher and a lurking danger with a decades-long vendetta. Meg Ashley’s relationship with her famous mother, Frances Ashley, is complicated at best. Years of neglect have festered a resentment that reaches its breaking point on Meg’s latest visit to see Frances. Her anger at her mother’s most recent behavior is fanned by Asa Bloch, Frances’ assistant who suggests she write a tell-all getting to the truth of what really happened in Kitten, and how negligent and duplicitous her mother truly is. Kitten—the 1976 horror novel who helped Frances Ashley reach cult status—chronicles the story of a psychotic young girl who is suggested to have committed murder. Through the years, crazed fans have deluged the internet with conspiracy theories, but the real story remains on the island, with the girl Frances Ashley based her story on—Dorothy Kitchens. So Meg heads to the largely uninhabited island, to meet Dorothy at the now-closed Ambletern Hotel, and get to the truth of what happened so many years ago. 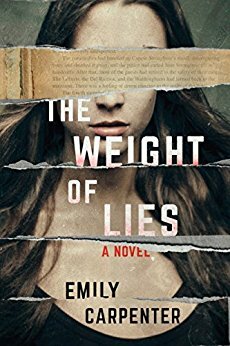 Instead of truths, however, Meg finds more lies to untangle and a group of suspicious people all with something to hide. As she digs deeper and the story reaches its culmination, it becomes clear that she’s in danger. The past is back for blood. The entire story thrums with tension as a relentless, unnerving feeling tightens its grip. It’s a menacing murder mystery with nods to horror threaded through its narrative. The plot tangles and untangles masterfully, to the point where you don’t know who to believe anymore. Meg’s perspective is interspersed with passages from Kitten, as a way to give readers a sense of creepy parallelism between what happened then and what’s happening now. Overall, this is a well-crafted, must-read thriller with bits of romance, horror and intrigue used strategically by Carpenter to keep pace and amp up tension.